They have style, they have talent, they know how to put on a superior rock show, they sport oh-so-2008 styles, but more importantly they respect the art form they preach: indie electronica/rock & roll. 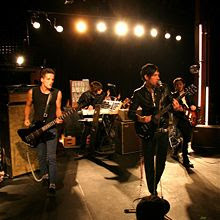 The Bravery, an indie rock band from the Big Apple who have been hitting the waves ever so actively since their huge hit 'Honest Mistakes' gave The Killers a serious run for their proverbial money. The last time I saw The Bravery in concert was back in 2005 in Salt Lake City. Much has happened since them. For starters they have gotten more mature, have produced better and more substantial music. Whereas I have been to countless concerts and I always opt to see them if they happen to be in the same area. This time around I saw them at the Newport in Columbus, OH this past Friday night. The Switches opened for them and it was a welcomed distraction. Their sound lends itself to easy associations and that is as good a reason as any to enjoy an opening act. The Bravery hit the stage past 10:00pm and what a show it was! The lead singer's exuberance and enthusiasm were appealing. His vocal presentation had a nigh paralyzing effect on me and standing but a few feet away it dawned on me just why I like good indie rock&roll: It truly is pleasing to all of my senses. The bands members were sporting time-appropriate attire, their guitar and vocal sounds were superior, and they have that gendered and marginally centered look. I highly recommend both of their projects and if they happen to play in your area, go see them. It will be obvious to you that these performers love to rock. It will be an energizing and aesthetically pleasing experience. Ah, if only I had gone. Marginally centered? Ha. Leave it to you to come up with such a thing! I like, I like.